Here’s a recipe you can start with. . . . Prepare the ingredients – peel, wash, seed and coarsely chop, what needs to be and just dump it all in the blender or food processor, in batches. Dump in a bowl and mix well. Freeze in ice-cube trays, then dump in a double freezer bag. That’s all! 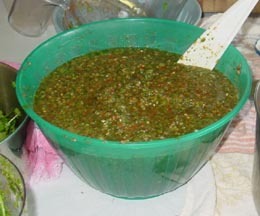 * Note that thyme, rosemary, celery and tomato or tomato sauce are not a traditional ingredient in sofrito. Tomatoes might be called for in a recipe but are a separate ingredient. I always have canned Italian Style tomatoes to use in rice and beans. You might not find all the ingredients, just use what you have, onions, garlic, and bell pepper are a must. Even though this recipe includes olives and capers I always add whole olives and capers to the dish.